And so, in this country which seems alldedicated to the divine adoration, how this subterraneous force which is always acting in the background, in antipole to the desire of elevation manifests itself and spreads ? The hell of the scenery one should say… The underside of the spiritual unification life isn’t it the war of religions ? Those ones have only had very short cease-fires, the radicalism of the religious communities being the germ of unremitting violences between muslims, hindus, sikhs, etc..
By instance, during a recrudescence of the conflicts between muslims and hindus, the call of the muslim League to the « Day of direct action » of the 16 of august 1946 made 10 000 deads in Calcutta. During the separation of the Penjab between Pakistan and India, the carnage was total : before the Independance, the population of Lahore was counting 500 000 hindus and 100 000sikhs. When the conflict was appeased, only one thousand of hindus and sikhs was remaining. At this period one evaluates over a half-million people slaughtered during their travellings on their way, because of their religion, to their haven land, India or future Bangladesh. In 1948, The Mahatma Gandhi, , « The Great Soul » was murdered by an hindu extremist. In 1962 the war with China occurred because of the border limits between the two countries. In 1965 and 1971 two conflicts exploded about Cashmere , then about the independence of the oriental Bengale. In 1980, one conflict was born with the sikhs who were asking for a separated State and a government. The riots were very bloody, and in 1984, Indira Gandhi was murdered by her sikh bodyguards. In 1992, riots exploded after the destruction of a mosque by fondamentalist indians in the towns up north of India, making several hundreds of deads. In 1995 the recrudescence of religious violence in the north of India caused the fires of sanctuaries and of one thousand houses. Agressions against tourists increased, causing murders and kidnappings. In 1999, after a short truce, war starts again between muslims and hindus in Cashmere. But the undersides of paradise are not made only of wars, but also of misery. A priest was saying recently that if there was not so much poverty in India, there would not be so much religious fervor and so many temples. The deprivation in which a majority of indians is living is extreme. 90% of the money is being hold by only about ten indian families. Misery, is also the fate of the women burned alive by their family-in-law (often covered by gasoline when they are cooking at their stove, all becoming an alleged accident), in order to recuperate the dowry. It’s also the women who , working nine hours a day in the fields, do not even obtain enough salary to buy rice for a living. Misery is the thousands of orphans who live and die in the streets of the big cities, it is prostitution and Aids which spreads out. On ignore la raison de leur goût pour la chair humaine. Sans doute à cause du prix du bois utilisé par les habitants des Sundarbans pour incinérer les morts. Il coûte si cher qu’ils ne brûlent pas entièrement les corps et jettent dans le fleuve les restes de corps à moitié calcinés. The day we took a barge to cross the river, we have passed a dead who was brought away on the other bank, badly wrapped in an old jute bag, with a face cut into bits, with open eyes. It was a fisherman.He was leaving on his rowboat to sell at the market, for some rupees, the three shrimps he just had fished , and could not afford keeping for himself, when a tiger appeared on the water surface and caught him on the deck. The animal had located him in the forest and followed him since two days.The Sundarbans tigers never attack by front, but always by behind. They observe their prey, wait, crouching in the grass and fall upon them when they are the most vulnerable, when they turn their backs. One does not know the reason of their taste for the human flesh. 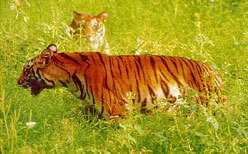 No doubt because of the price of the wood used by the inhabitants of the Sundarbans to incinerate the deads. It’s so expensive that they do not entirely burn the bodies and throw the remnants of the half calcinated bodies away in the river. Le Bengale est fier de ses derniers tigres. Ils sont moins de 400 et ont survécu car l’endroit est d’un accès trop risqué pour les chasseurs. Ils mènent une existence aquatique, nagent, boivent l’eau de mer, agressent les crocodiles, dévorent les poissons et tuent trois cents hommes par an. Quand ils partent récolter le miel sauvage, l’une de leur seule source de richesse, les paysans des Sundarbans, afin d’intimider les fauves qui attaquent par-derrière, portent sur la nuque un masque d’aspect humain équipé d’un système électrique qui fait étinceler les yeux. Gaston était arrivé à Calcutta à 35 ans, avec pour tout bagage un rasoir, une brosse à dent et les évangiles, et s’était installé à Pilkhana, le bidonville le plus sombre de la ville. L’année précédente, la partition avait contraint 11 millions d’hommes venus du Bangladesh et du Bihar à se réfugier dans “la cité de l’épouvantable nuit”, et Pilkana constitue l’une des plus fortes concentrations humaines de la planète. Gaston y créa un premier dispensaire. On n’imagine pas plus pauvres que ces taudis surpeuplés, privés d’eau, d’électricité, de fenêtres, bordés d’égouts à ciel ouvert, d’une puanteur insoutenable, où pullulent les rats, les cafards, les scolopendres, les cancrelats, les tarentules, la vermine, et des centaines de vaches confinées dans des étables sordides, tous générateurs de maladies et d’épidémies. Gaston dormait dans une cour, tête bêche avec 80 lépreux. Plus tard on lui donnera une chambre de 1m 50 sur deux dont personne ne voulait car elle fut celle d’un pendu. Huit mois par an la température dépasse les 40 degrés et l’hygrométrie les 98 % d’humidité. Chaque matin, ils sont 100 000 à faire la queue devant une pompe qui crachote une eau saumâtre, et comme il n’y a pas de latrines, Gaston faisait comme tout le monde, il se soulageait dans les égouts qui débordent et inondent les taudis pendant la mousson. le soleil est levé et tu dors encore !